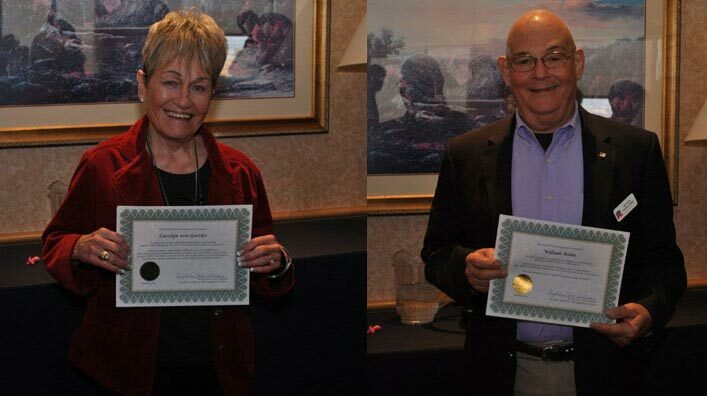 Congratulations to Shirley Zeiner for receiving a Certificate of Appreciation at our November 18th meeting. 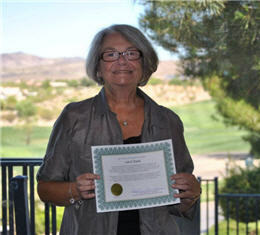 As many of our members know, Shirley spends countless hours volunteering at Congressman Joe Heck’s campaign office. 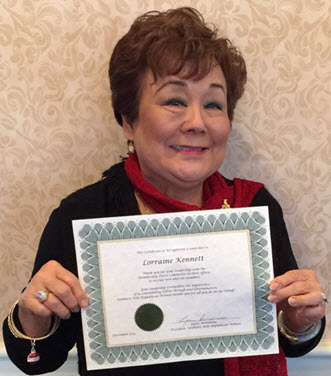 This year was no exception as Shirley spent over 600 hours (and counting) working at Congressman Heck’s office. We applaud you Shirley for your passion in support of re-electing Congressman Heck. It’s people like you that make Nevada’s grassroots efforts so effective! Thank you Shirley!!! It’s not Ghostbusters . . . its Dot and Linda! 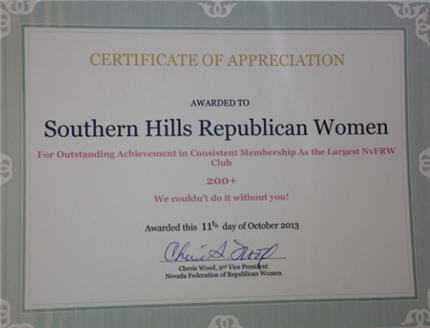 The Southern Hills Republican Women were very pleased to present Carol Tank with a Certificate of Recognition award at our July 2013 membership meeting. Carol’s passion and steadfast dedication in developing our club’s First Essay Contest at Del Webb Middle School was extraordinary. She devoted months of time and attention to this project from working with the school administration, to working with the Literacy Committee in developing the essay contest program guidelines, to the final end of presenting the awards to the children. (If you would like more details on the essay contest and how the project was developed, please take a look at our June 2013 newsletter). Carol, we are so very proud of you and appreciate all that you have done in making a positive contribution and significant impact in our community. 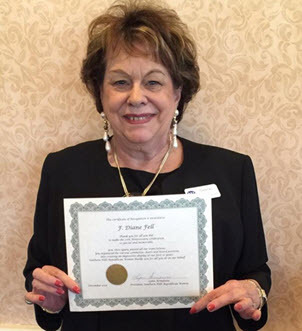 The Southern Hills Republican Women were pleased to award Paula Richter with a Certificate of Recognition award at our July Membership meeting. Paula has consistently amazed us with her generosity, time and commitment! Month after month, year after year, Paula has made beautiful gift baskets with amazing creativity and attention to variety and content. And, if that is not enough, she then lugs those heavy baskets of goodies around the room to encourage ticket sales at each lunch meeting!! Paula you have, and will continue to have, our heartfelt appreciation for all you have done for us. To say that we are going to miss Veronica Westurn now that she is moving to Missouri is an under-statement. 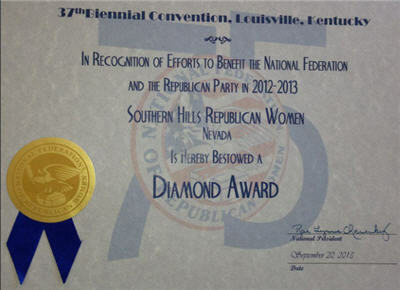 She joined Southern Hills Republican Women on December 5, 2005 as one of our charter members. In 2008 she joined the Board as Co-Treasurer and served one year. 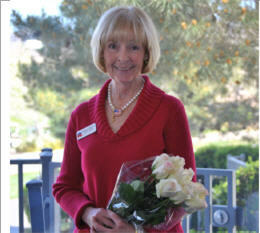 She then began working as hostess at our luncheons greeting people as they arrived. For the past three years Veronica has capably headed our audit committee. She is always the first to volunteer for everything from the Lincoln Day Dinner, to conventions, to our state caucus. No task has been too large or too small for her participation. Veronica does not just help but often is fully responsible for whatever need exists such as managing the gift exchange table at our Christmas luncheons or auditing our club’s books. Once a job is turned over to Veronica one can rest assured it will be executed effi-ciently and politely, always with a smile on her face and a kind word for everyone. She has been an asset to our organization and a valued member. All our best wishes are extended to Veronica as she moves on in her life. She leaves many friends and we wish her well. 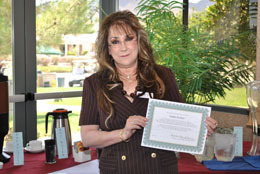 Carolyn von Gortler won the first SHRW Certificate of Recognition for her successful voter registration drive in January 2012. Carolyn undertook this project with her usual fervor illustrating her organizational skills and thorough execution of the task. Not only did she find and schedule the volunteers for the entire month of January, she contacted all the sites to receive approval for Voter Registration tables and then put together several kits which included everything from table cloths, voter registration forms, clip boards, pens, cheat sheets, and much, much more. Carolyn undertook this mammoth task and streamlined it so it ran like a well-oiled machine. Carolyn is starting up the program again in March to run through October and can always use more volunteers. Bill Kohn also won the Certificate of Recognition in February for his stellar work in organizing the Sun City Anthem caucus. Bill is an associate member of SHRW and a member of the Republican Club of Sun City Anthem. Bill’s work started in November working on behalf of SHRW and SCA to secure permission for the caucus to be held at SCA and then with the CCRP (Clark County Republican Party) working out most of the details involved. Quietly and efficiently Bill was always in the background dealing with both SCA and CCRP insuring things ran as smoothly as they did. If there was any criticism to be had for this year’s caucus, absolutely none of it was associated with Bill but was in spite of his efforts. We are lucky to have had him silently at the helm of the entire process. 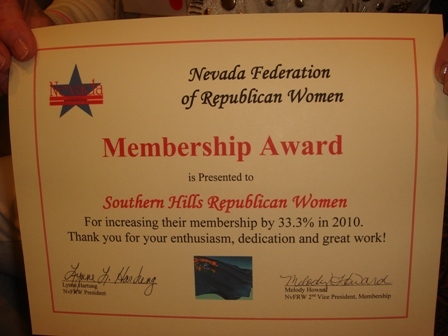 On October 16, 2010, the Southern Hills Republican Women was awarded the Membership Award by Nevada Federation of Republican Women for increasing our membership by 33.3% in 2010.